Early morning sunlight trickles onto the back porch while the intoxicating aroma of sweet honeysuckle dances on the breeze. Jeffry Culbreth and husband Tom Farley sip their coffee, wisps of steam from their mugs intermingling between them. Easy mornings like these, away from the hustle and bustle of honking taxicabs and crowded sidewalks, are just what they had imagined for retirement. Indeed, there was a time when the bright lights and excitement of the metropolis beckoned, and Jeffry concedes that she adored her 32 years working as a talent producer, booking celebrity guests for several popular television series, including “The Rosie O’Donnell Show,” for which Jeffry won an Emmy, “The Today Show” and “Martha.” But in the back of her mind, she’d always dreamed of opening a quaint shop in a small town and living in a storybook cottage. In 2008, with her two kids out of the nest, she bid farewell to New York and returned to her roots in Lower Alabama. Tom, an attorney, began downsizing his practice and joined her when he could in Fairhope. After working booths at a couple of antique malls and assisting at a consignment shop, Jeffry felt ready to take on the store she envisioned. 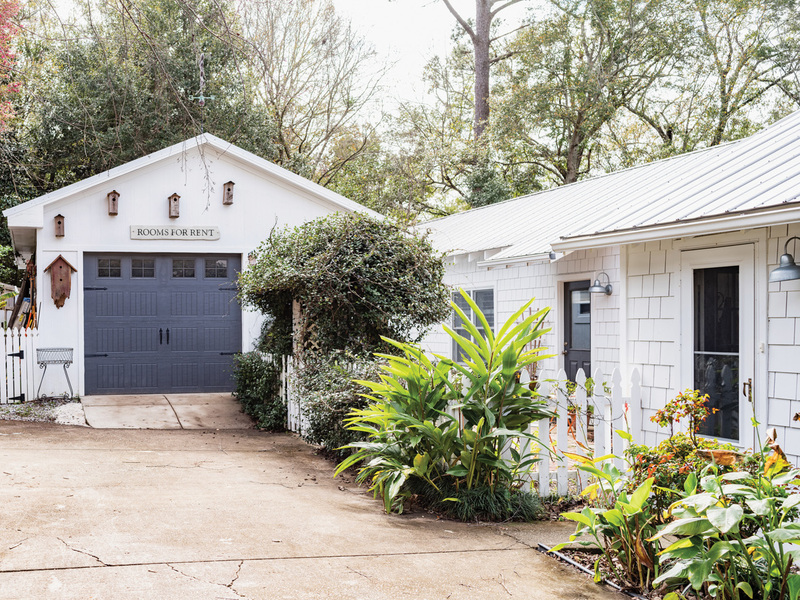 Today, she is co-owner — with designer David Van Colvin — of Section Street’s chic emporium Fairhope Furniture Consignment. In addition to upscale — and yes, quaint — used furniture, the popular spot also carries stylish retail accessories. Part one of Jeffry’s wishful thinking became a reality. 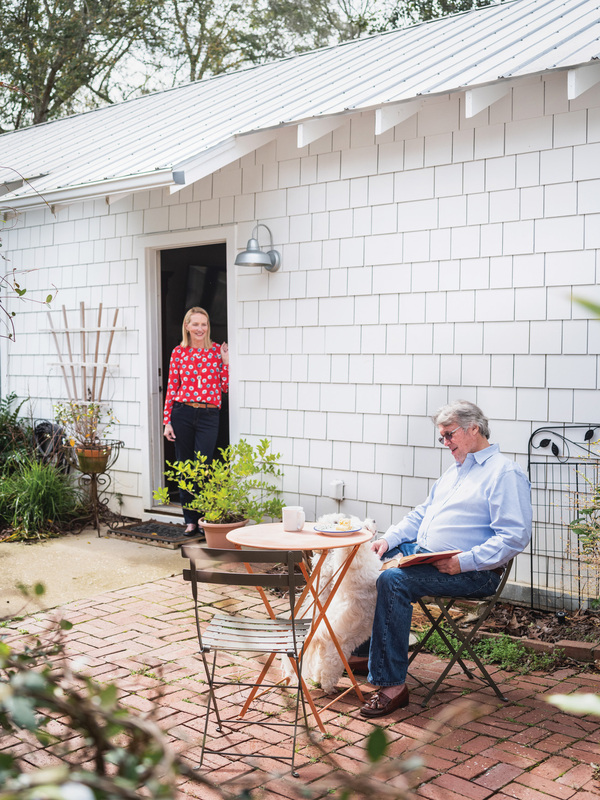 True to their propensity for vintage, in 2014, Tom — by then a full-time Bay resident — decided to purchase an old cottage in historic Daphne. A natural visionary, Jeffry could see beyond the mustard-yellow siding, tattered red garage and haphazard additions to the circa 1920s place. Tom, ever the “piddler” and an avid woodworker, reveled at the thought of constructing new oak cabinetry for the kitchen. 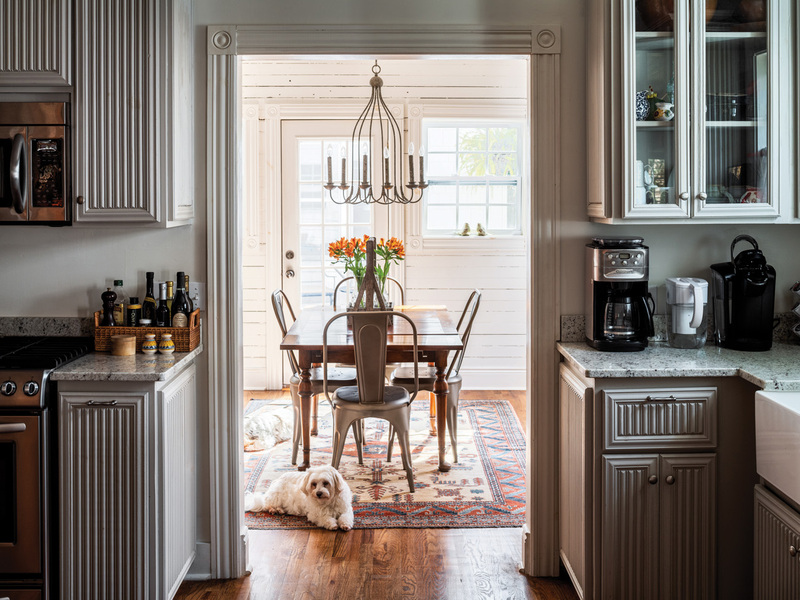 The two set out to make the place their forever retreat for themselves and their two Havanese pups, Otis and Murray, and a coastal vacation hub for their adult kids and their grandchildren (one and hoping). 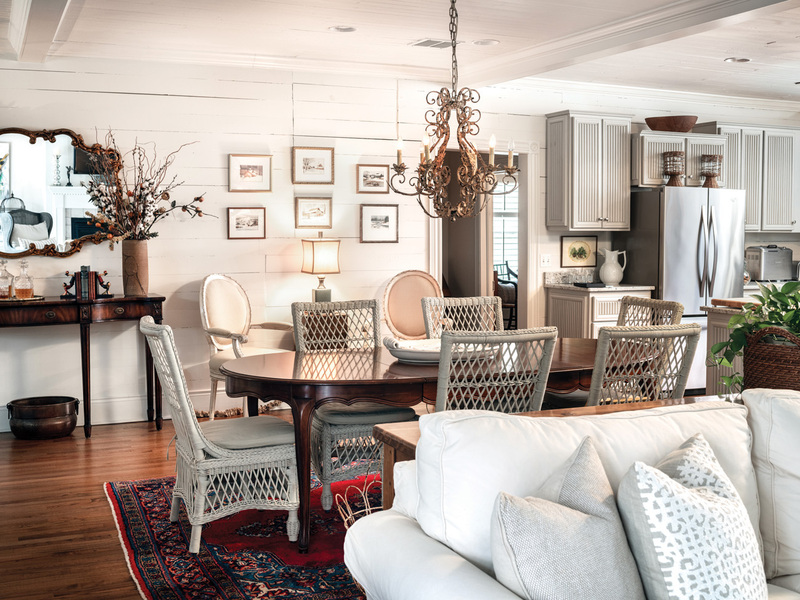 Following the kitchen, bathroom and master bedroom overhaul and plenty of coats of Decorator White paint, Jeffry assembled an eclectic and refined collection of furnishings and decor, old and new. 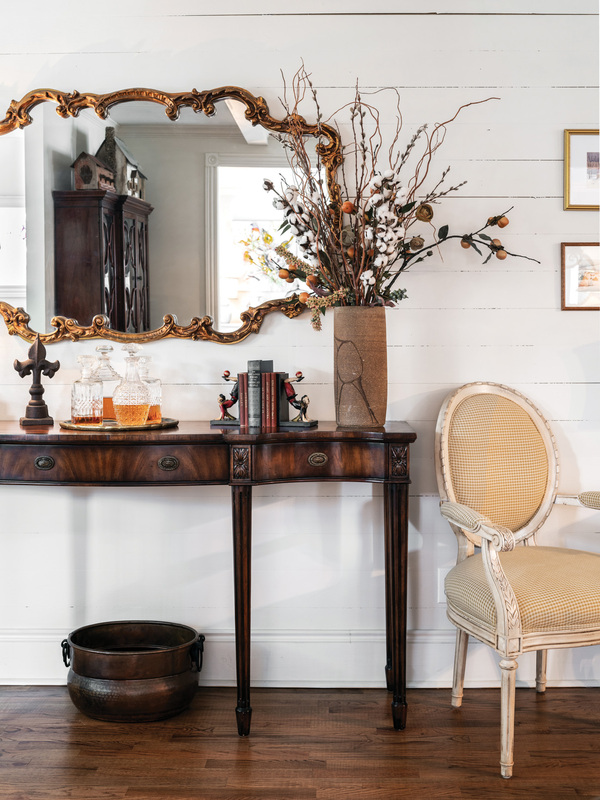 In addition to family heirlooms and antique Oriental rugs, crisp white textiles paired with gray painted accent pieces and natural wood family heirlooms create a casual yet sophisticated French country aesthetic. Just as they had hoped, Jeffry and Tom are enjoying a tranquil lifestyle near the Bay. 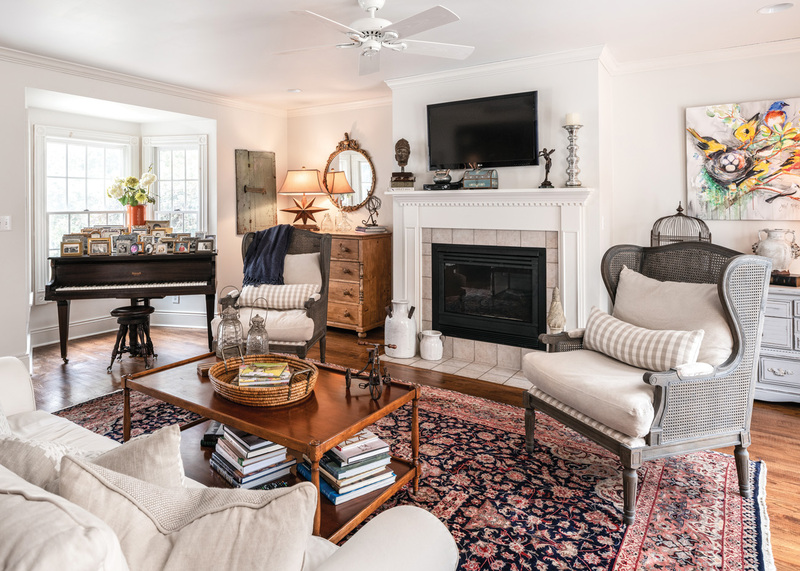 A white slipcovered sofa, gray cane wingback chairs and a crisp ivory mantel keep the cottage airy, while rich wood accent tables, all from the consignment shop, add dimension and warmth to the space. The old, photo-laden piano belonged to Tom’s mother. 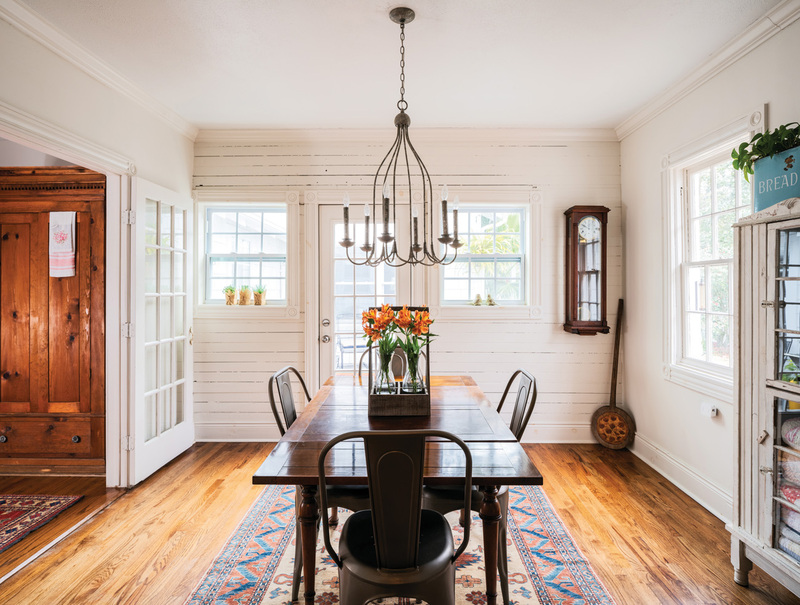 One of the couple’s most treasured pieces is the dining room table, which originally belonged to Tom’s parents. 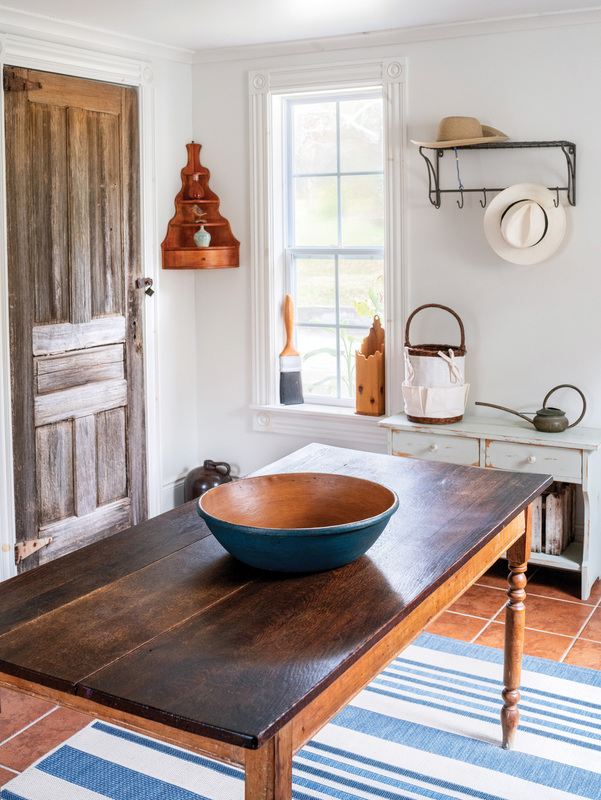 When Jeffry had the piece refinished a few years back, she was quick to make sure that one element remained completely untouched: one edge of the table is covered with scrapes and nicks that Tom vividly recalls carving as a child with his knife during dinnertime. 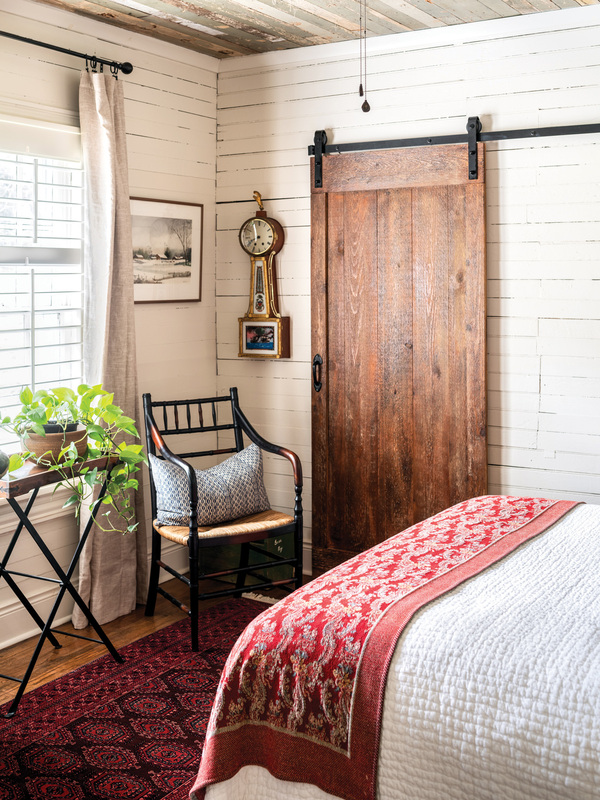 In the guest bedroom, shiplap paneling coated in Decorator White paint and stained wood sliding barn doors lend a modern farmhouse appeal. Jeffry folds laundry on this Vermont farm table. Tom’s brother donated the vintage door for the utility room. With two patios and four porches, the home has an indoor-outdoor vibe. Although Jeffry admits that she does occasionally miss the New York food scene and Broadway, she couldn’t be happier to be home. Likewise, Tom quickly became enamored with life in the South and the friendly community of the Eastern Shore. “He laughs and tells people that you could sit still through three red lights and not a single person would honk their horn at you,” says Jeffry. Tom has enjoyed woodworking since his teens when he learned the trade building signs in Vermont. In place of the former garage, they built a workshop where Tom could enjoy his hobby. The sign is a running joke, welcoming visiting feathered friends.